Big Shot 500 | Alpine Products, Inc.
GENERAL The intent of this specification is to describe the minimum requirements for a bituminous melting and application system to be used for the placement of pavement markers. This unit shall conform to all standards for bituminous application equipment, including but not limited to, continuous agitation. The system shall have a flexible heated output hose and wand with an electronic temperature monitoring system for accurate control of both material and hose. The system shall be equipped with a positive displacement pump for dispensing preset, volumetrically controlled shots of bituminous material. CYCLE RATE Unit shall be capable of dispensing a minimum of 30 shots per minute at a shot size of 13 cubic inches each and a material temperature of 425° F. MATERIAL CAPACITY Unit shall be capable of heating 500 lbs. of bituminous material with a specific gravity of 1.4 to a temperature of 425° F from an ambient temperature of 50° F. Unit shall be capable of dispensing material one hour after lighting with 200 pounds of material in melter. MELTING TANK This tank shall be of all welded steel construction. Tank shall be round. Bottom of tank shall be ¼ inch thick steel minimum. It shall be equipped with a flame shield, which prevents direct contact between the flame and the bottom of the kettle. Tank shall be LP fired using an impinged jet type burner with an output of 150,000 BTU/HR. Dimensions of the melter shall be 24 inch ID. X 24 inch deep. LOADING HATCH The melter shall have a continuously hinged opening of 12” X 8.5” minimum, with an open area of 102 square inches. Lid shall be designed so that the lid closes away from the operator. A locking pin shall be provided to securely lock melter lid while transporting.AGITATOR Melter shall be equipped with a continuous, full sweep hydraulic agitation system to prevent filler from falling out of suspension and to speed the melting rate of the material. Agitator shall rotate in one direction and will have a variable, pressure compensated flow control to vary both hydraulic flow rate and agitator speed. Units without variable speed agitators will not be accepted. POSITIVE DISPLACEMENT PUMP Pump shall have adjustable output up to 13 cubic inches per stroke. Pump will have no elastomeric seals and the only moving part shall be the pump plunger. Pump to be hydraulically driven using a drive cylinder with a stroke of 6 inches. 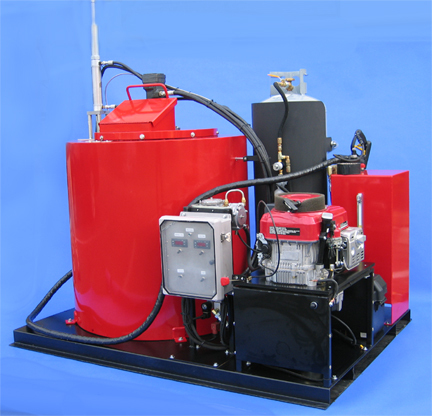 Pump to develop a maximum of 500 psi of output pressure with factory set hydraulic pressure. Pump to be mounted inside of a chamber immediately adjacent and integral to melting vat. Pump plate shall be mounted to bottom of melter and sealed to mounting plate with a ¼” dia Teflon o-ring. Side mounted pump chamber to have direct exposure to hot air exhaust. To eliminated coking of bituminous adhesive, material outlet tubes crossing under melter and exposed to flame will not be accepted. Pump must be serviceable without removing kettle lid or agitator. SHOT SIZE ADJUSTMENT Shot size adjustment shall be accomplished using a mechanical stroke limiter for simplicity and ease of service and trouble shooting. Unit shall be variably adjustable up to the maximum output of pump. Units that use electrical reed switches and/or relays to adjust shot size will not be accepted. HEATED OUTPUT HOSE Output hose shall be 10 feet long with a 2-foot rigid applicator wand (optional length hoses and wands available). Hose to be electrically heated with the heating element integral to the outer cover. Hose to be Teflon inner core and stainless steel over-braid with a minimum working pressure rating of 500 psi continuous duty at 425° F. Hose shall have a minimum safety factor of working pressure to burst pressure of 3 to 1 at temperature. A type J thermocouple type temperature sensor is to be attached to the stainless steel over-braid. Hose to be insulated in order that the maximum external temperature will not exceed 175° F (excluding fittings). Hose shall be operated with 12 volts DC electric current for safety. Hose shall be insulated and covered with a high temperature outer sleeving to protect the hose from external damage and kinking. Hose shall come up to operating temperature and be ready for operation in 30 minutes or less from an ambient temperature of 50 deg F. TEMPERATURE INDICATION The melter applicator shall have digital electronic temperature controllers that will automatically regulate the material temperature and the hose temperature. The controls shall have individual digital readouts for material and hose temperature. The material thermostat shall control the burner ignition automatically up to a temperature of 450 deg F. The hose thermostat shall control the hose temperature up to a temperature of 400 deg F. CONTROLS Pump to be controlled by a 12 volt DC, 4 way electrically operated hydraulic valve. Pump and hydraulic system shall be operational from 60 to 300 psi. A Gas Control Module shall control melting tank temperature and gas burner ignition to a maximum temperature of 450 deg F. Module shall include a 12 VDC gas ignition system for lighting burner and a 12 VDC solenoid valve to control gas flow. Module shall include on-off switch, and panel light to indicate system status and a type J thermocouple to sense material temperature. It shall also include a safety circuit that senses loss of flame. A Hose Controller shall regulate hose temperature. The temperature is to be sensed using a two-wire type J thermocouple sensor that is attached to the stainless steel over-braid of the hose. Temperature range of the solid state hose controller shall be 200 to 400° F. ENGINE Honda air-cooled, four cycle, single-cylinder engine. 13 HP at 3600 RPM Factory converted for propane operation Electric Start Equipped with spin on external oil Filter Electronic Ignition High efficiency air-cooling fan Optimum engine speed is preset at the factory to properly power the hose and wand All appurtenances required for operation shall be included Vacuum operated propane safety shutoff system in the event the engine stops running POWER PACK & MOUNTING Motor, hydraulic pump and alternator shall be modular and easily removed from unit for service if desired. Power pack to be mounted on skid using vibration isolators properly sized for the total weight of power pack. A 105 amp automotive style alternator shall be supplied to power hose and charge the battery. Alternator shall be belt driven by engine using a serpentine style belt. An easily adjustable mechanical tensioner and roller shall be supplied. Units that require the alternator to be moved to adjust belt tension will not be accepted. Hydraulic pump shall be a pressure compensated type of pump. Gear type pumps that dump excess flow over a relief valve will not be accepted. Power pack shall be delivered complete and ready for operation with all proper safety valves, filters etc required for operation installed. MOUNTING SKID Unit shall be mounted on a steel skid with captive slots for easy loading and unloading using a forklift. Skid shall fit within the wheel wells of a standard size ½ or ¾ ton pickup truck. Skid shall measure 66 inch long X 48.0 inch wide X 2.5 inch high.FINISH Skid and melter and all exposed steel parts shall be finished with Polyester powder coat or bright zinc plated for corrosion resistance. MANUAL A complete set of parts, service, and safety manuals shall be provided on all equipment furnished with unit. TECHNICAL SERVICE A toll free technical service number shall be provided and shall be staffed from 7:30 to 4:30 PST weekends and holidays excluded. Successful bidder shall have full inventory of spare parts available for same day shipment at a location within the State of California. START UP AND TRAINING A minimum 1-day (8 hours) start up and training shall be provided by a factory trained service representative. Training shall take place at customer’s location and at a time mutually agreed upon by customer and successful bidder. OPTIONS 1. A safety switch on the fill lid shall be provided which will stop the agitator when the fill lid is opened.